Draw inspiration from the past with the Sunbrella Icon Collection. These unbelievably long-lasting fabrics yield a design that mirrors the pastel tones of the 60s and lively colors of the 70s. Made from durable Sunbrella acrylic, these upholstery fabrics will look great under any condition. 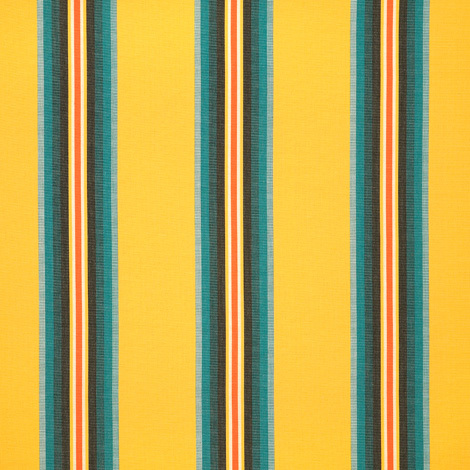 Pioneer Sunrise (58011-0000) presents a lovely striped pattern of yellows and blues. The fabric is ideal for umbrellas, curtains and drapes, patio furniture, decorative pillows, cushions, and other applications. The maintenance-free material is both mildew repellent and water resistant.